The vast majority of people living with HIV are in low and middle-income countries. Sub-Saharan Africa is the most affected region, with an estimated 25.6 million people living with HIV in 2015. Kenya has an average HIV prevalence rate of 6%. With about 1.6 million people living with HIV infection, it is one of the six HIV 'high burden' countries in Africa. The Kenya AIDS Response Progressive Report, by NACC reported that between 2013 and 2015, new HIV infections in Kenya among the youth (15-24 years) increased by 17% despite the 19% reduction in new HIV infections among adults (15+). The youth (15-24 years) contributed to 51% of adult new HIV infections in 2015. Kenya has made tremendous progress in a number of the global targets and has achieved 20% reduction on sexual transmission of HIV and 49% reduction of new infection among children. But beyond the good progress, targeted interventions are needed for adolescents 15-24 years in order to tackle increasing new HIV infections. Low access to information has not only facilitated risky behavior but also promoted stigma and discrimination of the infected. Stigma and discrimination are the main barriers to achieve the goal of HIV reduction. To address the increase in prevalence of HIV/ AIDS among the youth in Kenya, the National Aids Control Council (NACC) along with the partners UNAIDS, Kuza Biashara, Sauti Skika, LVCT Health embarked on a program dubbed as “Maisha County League” that taps into the youth’s passion for football while disseminating awareness on HIV/AIDS. 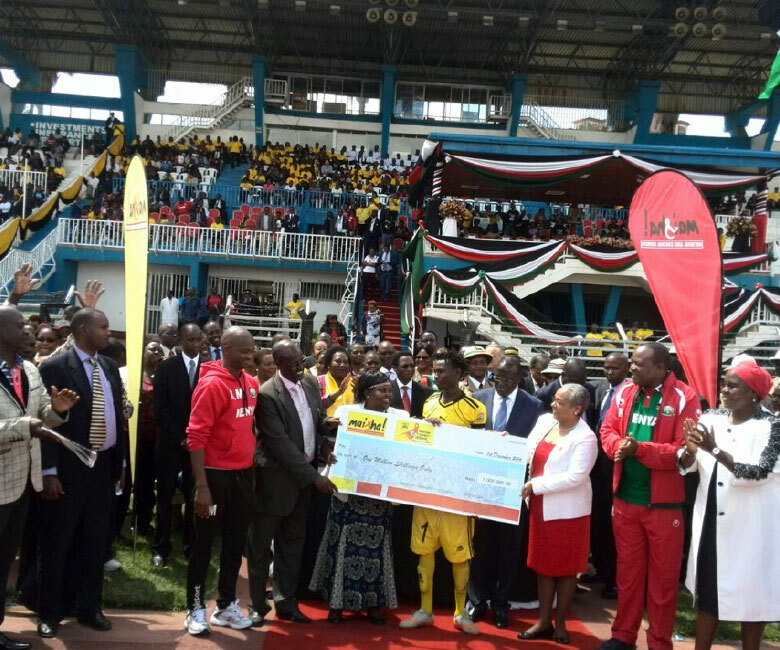 The Maisha County League mobilized youth, government, private sector, civil society and development partners in a campaign and football league to #KickOutHIVStigma from Kenya and link young people to stigma-free HIV testing, treatment and care. The Digital platform allowed youth the freedom to explore facts, myths and information on HIV/ AIDS via their own smart devices, leading to peer to peer conversations, accessing mentors & ultimately leading to testing. I wish to thank the private sector, the UN organizations. There is a digital platform (Maisha Digital Platform powered by Kuza Biashara) that has already reached almost 3 million young people with HIV education, this is fantastic, and I hope this is something we can expand the use of throughout the country.